Chronic stress, illness, poor daily diets and pollution call for foods that can protect and foster good health. 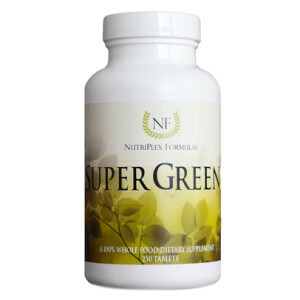 The 18 super foods packed into Super Greens support all systems, organs and biological functions involved in healing, defending against cellular decline and the support of every system in the body. Excellent for “multiple” vitamin pill replacement, general and specific health support, wellness, energy, sports endeavors, active and inactive people, & more! Inactive Ingredients: Cellulose, Hydroxypropyl Cellulose, Croscarmellose Sodium and Silica. In addition to the unique properties, synergists and cofactors of this food, each serving provides the following nutrients contained within the above food-nutrient blend (not as isolates): Vitamins (beta carotene and the carotenoid complex, and vitamins complexes A, B, C, D, E and K), RNA, DNA, Minerals and Trace Minerals (calcium, iron, zinc, potassium, magnesium, copper, manganese, sulfur, iodine, selenium, phosphorus, cobalt and more), Choline, Amino Acids (aspartic acid, glutamic acid, serine, glycine, histidine, arginine, threonine, alanine, proline, tyrosine, valine, methionine, cystine, isoleucine, leucine, phenylalanine, lysine and tryptophan), Chlorophyll, Fiber, Flavonoids, Pigments, Enzymes, Coenzymes, other phytonutrients and “grass factors.” Cereal grasses are complete foods, as they supply a wide array of pure, whole nutrients. 8 tablets or 1/2 tbsp. of powder daily, or as directed by a healthcare practitioner. The leading cause of illness today is a lack of nutritious foods in the diet. Super Greens contains 18 real, whole, raw and pure foods that provide a powerful supply of nutrients that can only come from vegetables. For healing, growth, prevention and cellular functions, the body craves nature’s nutrient-rich foods. This product is the ideal “multiple” for the whole family, and especially for those who are sick with either chronic or acute problems. This formula is ideal for diets that are devitalized and contain enriched, depleted, chemicalized and refined foods — especially for those recovering from illness and those lacking green vegetables in their daily food intake.